The latest Vacheron Constantin Overseas Chronograph remains the occasional center of debate since its first unveiling in early 2016. A reconfiguring of its subdials, alteration of its bezel and case design, and most notably the switch from a big-date display at 12 to a standard date between four and five o’clock were all contentious issues amongst the collecting community, though overall the updated model has been generally well received. 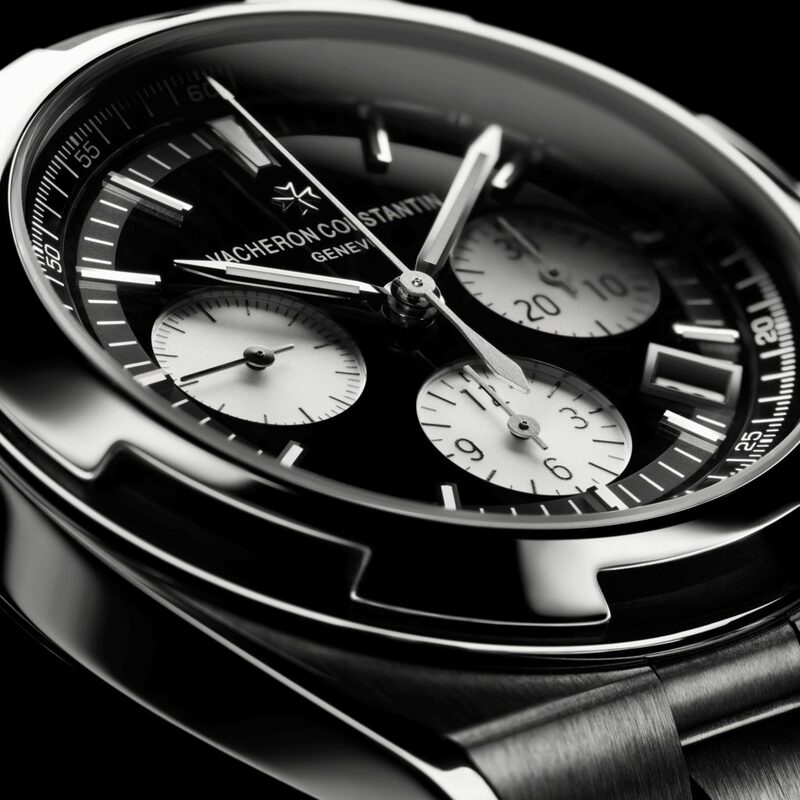 Most recently, Vacheron unveiled a pair of black dialed variants including this reverse-panda dialed chronograph. Capitalizing on an ever-growing trend in the watch industry of late, the new dial is the first chronograph in the collection to ever feature contrasting subdials—a real departure from anything previously offered. It’s safe to say I’ve been a fan of the majority of the new Overseas line since day one, so taking the new reverse-panda out for a spin was something I just couldn’t turn down. One of the big changes that came with the newest version of the Overseas is its new in-house manufactured column-wheel chronograph movement. Good for a 52-hour power reserve, the new caliber uses a vertical clutch coupling and column wheel mechanism, and is elaborately finished with Geneva striping throughout. Unlike its predecessor, the caliber of the new Overseas Chronograph (including its beautifully executed 22k yelow-gold rotor) is visible via a sapphire display caseback. It is said the caliber took Vacheron five years to develop, though they haven’t exactly reinvented the wheel here. The three-register configuration displays chronograph hours and minutes via subdials located at six and three o’clock, as well as running seconds located at 9. A screw-down crown and screw-down pushers give the Overseas chronograph a very reasonable 150m of water resistance, while the latter also add to its more casual and rugged aesthetic. Though there are a number of changes to the new model, Vacheron thankfully didn’t reinvent the wheel with the Overseas redesign. The gear-like notches in its bezel have been broadened to a six notch pattern instead of eight, and a fair bit of effort went into softening its case edges, giving it a more refined aesthetic. As mentioned, its dial features a more traditional and symmetrical layout than its predecessor with additional space found between its 3-6-9 layout subdials. Much like its beloved blue sibling, the dial of the reverse-panda is a very glossy black, with its warm silver subdials slightly recessed. These contrasting subdials make the piece more legible than most of its counterparts as well. 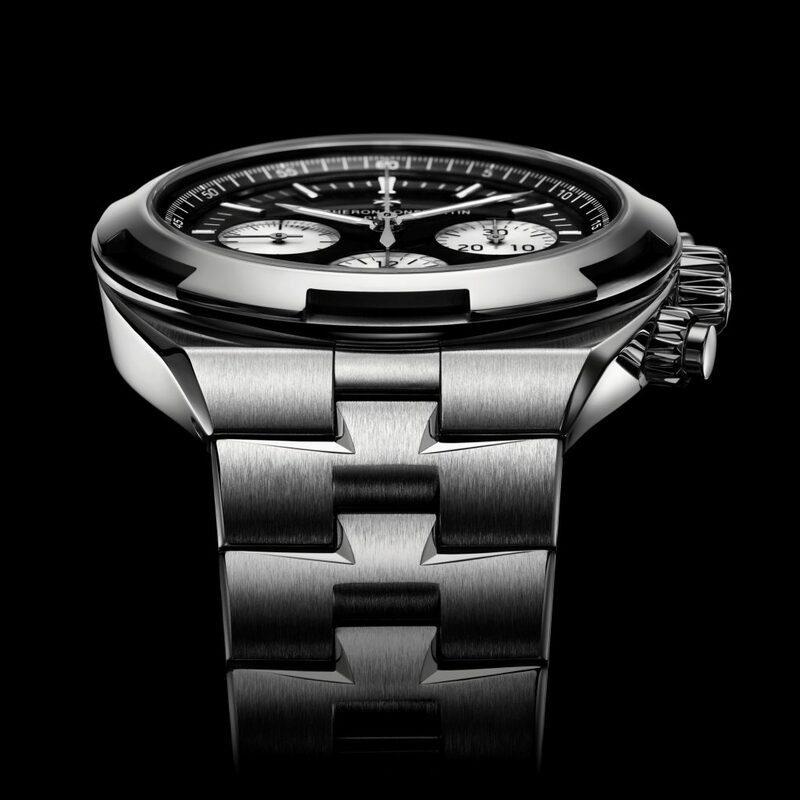 Measuring 42.5mm across and 13.7mm thick, the Overseas chronograph is relatively chunky on the wrist, though not to the point that it works to its disadvantage. Thanks to its lugless case design it still wears quite well on small and medium-sized wrists, especially when fitted to its rubber or leather straps rather than its bracelet. On the topic of the bracelet and strap setup, this is also a major change for the new Overseas line across the board. The ability to rapidly change straps on a watch has been something more and more brands have been getting onboard with recently, and though the straps (and bracelet) of the new Overseas look much akin to those of the previous version, the brand has conceived a very easy-to-use strap changing system that is fitted to every new Overseas model currently available. Each model is sold with all three strap options, and thanks to a quick-release tab, the straps are able to be changed in a matter of seconds once you get the hang of things. As an added bonus, Vacheron has also developed a clever micro-adjustment in the clasp of its bracelet, giving it just enough additional breathing room when being worn on those warmer summer days. Though Vacheron remains the underdog of the watch industry’s “Big Three” (Patek, Vacheron, and AP), many watches in their repertoire including the new Overseas are more than up to snuff to doing battle with the competition. At a $30,200 price of entry for the Overseas Chronograph, there’s a lot of competition out there, but in the same breath it makes a very good alternative to the Royal Oak Offshore Chrono, which on bracelet will run you north of $33k. The Overseas is also a touch more compact, understated, and generally more versatile than the hefty Royal Oak Offshore will ever be, making it a better all-around watch overall. Having worn the watch for roughly a week or so, I can safely say the Overseas is an easy one to bond with. Splitting my time between its integrated bracelet and rubber strap, the strap option remains the most comfortable in my books, in part because it helps reduce the overall heft of the watch both physically and visually. In the case of the smaller 3-hand or dual time models, the Overseas could even tuck under a shirt cuff, however the case thickness of the chronograph makes it just a touch to chunky for formal attire.